I admit, I love snickerdoodles. Cinnamon and vanilla? Yes, please. What’s funny is that I never really had them much as a kid, just occasionally in the school cafeteria. I know, ew. Anyway, snickerdoodles were one of the first cookies that the Munchkin helped make when he was little. He could help dump everything in the mixer (or “loud noise” as he would call it!) 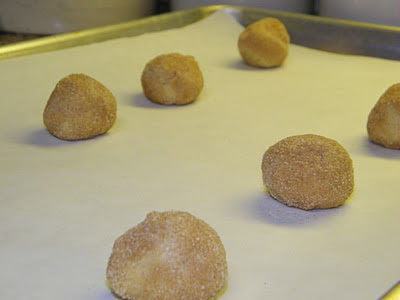 and then it was fun for him to roll the balls of dough in the cinnamon sugar before putting them on the baking sheet. Even since then, my go-to recipe for snickerdoodles has been this one by Emeril. It’s a great recipe, baking up a thin, crispy cookie (at least when I make them!). However, I was looking for something different this time, something thicker and chewier. I found this recipe from the blog How Sweet it Is. I decided to try it, and while I did keep the ingredient list the same I changed up the method a bit to suit me better. The result? What I was looking for – thick and chewy…and great tasting! I will say that it does not make many cookies, so depending on how many you will be sharing these with, you will probably want to double the recipe. Whisk together the flour, salt, baking powder, and cinnamon. Set aside. In the bowl of a stand mixer, cream together the butter and sugar until light and fluffy, about 2-3 minutes. Add the egg and vanilla, and mix an additional two minutes. Add the milk and mix another minute. Slowly add in the flour mixture, beating just until incorporated. The dough will look wet and sticky. Cover and refrigerate for 30 minutes. While the dough is refrigerating, preheat the oven to 375’F and line two large baking sheets with parchment paper. When the dough is ready, mix together the additional ¼ cup sugar and 1 Tbsp cinnamon in a shallow bowl. Using a #40 disher (about 1” across) scoop the dough into balls and then coat with the cinnamon sugar. Place on the prepared baking sheet and bake 8-9 minutes or until set. Remove from oven, allow to cool on baking sheet for 3-4 minutes, then remove to a wire rack to cool completely. I wish I could say I loved all snickerdoodles, but the crunchy kind are a no win for me! Its all in the chewy ones and these look like winners! My husband's all-time favoite cookie is the snickerdoodle (I enjoy them myself!). These look great! These look really tasty! I have to say, I'm not crazy about snickerdoodles (the first time I had them I was so disappointing they didn't taste like snickers) but I have never made them myself. Maybe I'll give them another shot! I love the design of your blog, by the way. The scrapbooking paper and flower are so cute! Katy, these look super yum. What a lovely addition it will make to a holiday platter! Those really do look thick and chewy, just how I like them. yum! I haven't made snicker doodles in a while, they are a great cookie any time of year! Mmm. I love how thick these look! And I thought my cookies were thick! 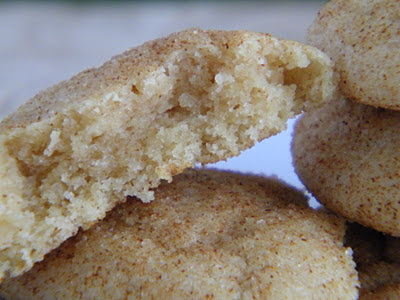 I usually use a classic recipe to bake my snickerdoodles, and they still are SUPER soft and chewy (mmm.. I love a good chew!) but I'm definitely going to try this recipe and compare! Could you subtract the cinnamon/sugar and add chocolate chips and make a chocolate chip cookie? I loved this recipe and the cookies stayed soft for days! Tara, I'm glad you liked them! I think that you could definitely turn these into a chocolate chip cookie. Hmmm...may be my next kitchen experiment! Thank you for commenting!